After waiting in line a long time, he got to the counter. 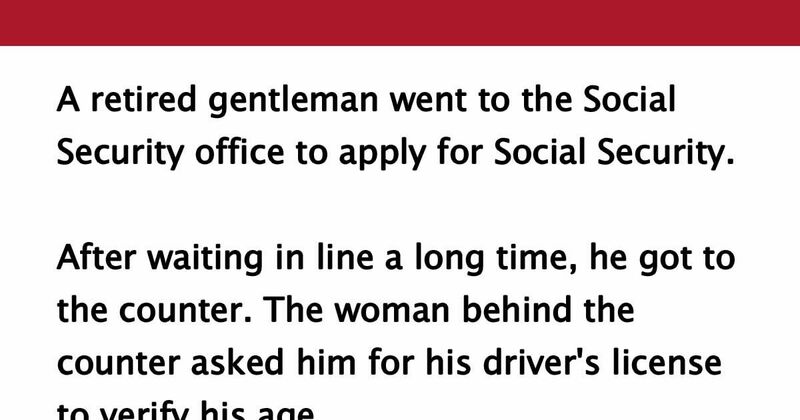 The woman behind the counter asked him for his driver's license to verify his age. He told the woman that he was very sorry, but he seemed to have left his wallet at home. “Will I have to go home and come back now?” he asked. “Unbutton your shirt,” the woman requested. So he opened his shirt, revealing a chest full of curly silver hair. “That silver hair on your chest is proof enough for me,” the lady announced, and she processed his Social Security application. Ouch! Like and share this one on Facebook if you enjoyed it!